Xtri’s Colleen Riley chats with Chrissie Wellington as she prepares for Ironman South Africa this weekend. 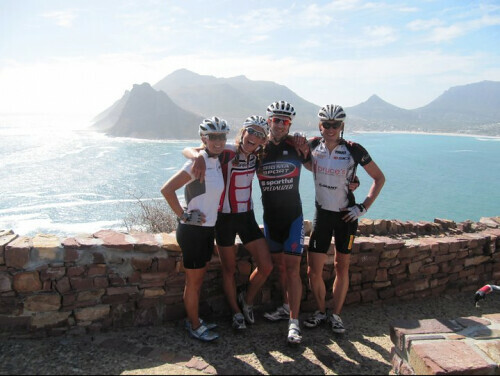 Chrissie shares her race prep in South Africa, 2011 race schedule, and mission to improve anti-doping action within triathlon. About a week out from IMSA and the first race for you in 2011, what can you tell us about your training and prep for this race? The prep has been going really well. I have been training in South Africa – in the amazing town of Stellenbosch – since mid February. I feel so fortunate to have been able to experience South Africa, to learn about the culture and history, indulge in biltong, braais and rooibos and soak up some of the most spectacular scenery in the world. This first hand experience with South Africa will undoubtedly make racing here so much more special. Stellenbosch is the most beautiful town. It is surrounded by vineyards (always tempting!) and beautiful mountains and has tree lined streets, whitewashed buildings and a passionate sports culture. There are some great open air restaurants and cafes, and the people are amongst the friendliest I have ever met. Plus I have had some great training partners here – Emma Snowsill, Jan Frodeno, Tim Don, Fraser Cartmell and my good friend Dion Harrison. I don’t want to jinx myself, but yes, training is going really, really well and I feel ready to race. In fact, I can’t wait to pit myself against the super strong pro field in Port Elizabeth! Where are you headed after IMSA? After Ironman South Africa I will head to the UK for a few weeks for the wedding of the year – my brother Matthew is getting married to his wonderful girlfriend, Kelly, on 29 April. After that I will go across the pond to Boulder for the summer. I will be heading back to Kansas 70.3 and will come to Europe for an ironman distance race in July (watch this space for an announcement about which one! ), followed by a couple more 70.3s before the Big Dance in Kona. You recently made a bold statement by publicly publishing your drug test results. Do you think this has quieted skeptics? We all need heroes and heroines – people we can look up to, respect and believe in. We want to believe that the pedestal our role models stand on is founded on hard work, determination, teamwork and a dose of good genetics – rather than the use of performance enhancing drugs (PEDs). Over the past year we have seen dramatic improvements in anti-doping action within triathlon, and specifically Ironman. The erstwhile cloud of silence about PEDs has begun to lift, with the media, athletes, race organisers and sponsors now actively engaging in dialogue about the issue, which can only be good for all concerned. But there are still areas for improvement, and that is why I recently took the step of publishing my drug test history (www.chrissiewellington.org). This includes the date of test, location, type of test, the testing authority and the result. This move has been met with a variety of responses, some positive and some negative. The criticism seems to stem from a belief that I am trying to shame other athletes, that the act was little more than an attention grabbing publicity stunt or that, by being vocal on the subject I actually have something to hide. These purported motives cannot be further from the truth. I took the step for the following reasons. First, to walk my talk that ‘silence is not golden’. Sitting there closed-mouthed or apathetic will not make PEDs go away. By publishing my results I wanted the issue of anti-doping to remain on the agenda, to be the subject of dialogue, comment and discussion – to bring this issue to the forefront and help it stay there. Second, I wanted to highlight the improvements in the frequency of tests undertaken since I became part of the WADA process in late 2007. Everyone who looks at my history can see the dramatic increase in the frequency, both in and out of competition, and also that these tests now include blood and urine, as well as the blood profiling process (where my blood is tested a minimum of six times per year to create a longer term picture/trend so that any irregularities can be picked up). Of course, I am only one athlete, and from this we cannot extrapolate across the sport and suggest that all athletes are being similarly tested, but I think it does show that our sport is stepping up its game. Third, I would also like to think that other athletes will follow suit and publish their results. That way we can all get a clearer picture of what is happening across the board, and utilise this information and evidence to applaud progress, and lobby for improvements as necessary. Of course I do not wish to condemn or demonise my peers who do not choose to publish. It is their prerogative and it goes without saying that, should they choose to keep their test history private, in no way should this be viewed as an expression of guilt. This isn’t going to bring about a sea of change – it is one small step. But journeys always begin in this manner and I hope that this little step will help to uphold the integrity and reputation of our sport, ensure that the competition is clean and fair, provide proof that people can achieve great things without the need to cheat and, as I have said previously, make sure that we can look at our sports stars, standing on their on their pedestals or podiums, with unreserved pride. You finished off 2010 on a high in note in Arizona and were also awarded Triathlon America’s Most Valuable Triathlete last month. What is your advice for someone starting out as a triathlete? I would firstly congratulate them on taking up the challenge and beginning a wonderful, exciting and rewarding journey! We all have our own personal barriers, be they mental or physical. We are all nervous about trying new things and giving ourselves bigger mountains to climb. We all worry about the ‘what if’s’. But you can do anything you want to – the only limits are those that exist in your mind. Four years ago I was asked whether I would ever do an Ironman. My response? ‘No way, you must be completely mad to do something like that!’ Imagine if I had never gone back on my word, if I hadn’t changed ‘I can’t’ to ‘I can’, if hadn’t dared to push myself harder, and most importantly what if I hadn’t had people to support, encourage, mentor and most of all make me believe in ME? So, my advice is simple – go for it! I would encourage newcomers to join a club and find friends to train with. It makes it a lot more fun. Women could also join GOTRIbal (www.gotribalnow.com) which is an organisation that links women together around the world who love sport and triathlon, and – using a pay it forward model – empowers them to do anything that may not have thought possible. I think it is very important for people to set short and long term goals, talking to a coach or trusted athletes for advice if necessary. These goals can be for each training session, and then longer term goals are races that you want to do. Each day is a stepping stone. It is also important to reward yourself when you achieve your goal – have a bar of chocolate or a nice glass of wine! Make sure you celebrate your victories and try to learn you’re your mistakes or your ‘bad days’. Remember that above all it is supposed to be fun – so smile and enjoy it. A couple of things I have learnt along the way are to really listen to your body. The more you rely on gadgets such as heart rate monitors the more difficult it is to develop a deep intuition about your body and its reactions. Don’t fall into the trap of thinking that more is necessarily better (eg more miles and hours does not necessarily mean faster and stronger). My former running coach, a man called Frank Horwill, always said “there is no such word as cant, only I will try”. I always try to live by that motto, and give everything I possibly can. You might not succeed at first but never give up – you can achieve your dreams. Just be patient and have faith in yourself. What is one thing you want to see, do, or eat in South Africa besides race? I cant wait to indulge in some of the best white wine that South Africa has to offer – Belinda Granger has promised to race me to the bottom of a bottle!